Think of all the men planning to openly carry guns at the RNC. Which ones are in the most danger of being arrested for suspicious behavior before the event? During? After? The Wall Street Journal gives the rundown of what is allowed in the RNC area. I think many of the black men considering open carry will be arrested before the event on some trumped-up charge, just to keep them out of the picture. The ones who make it to the protest will be fine, unless there is a panic. We all know what happened to the last black guy who open carried at a protest and there was a panic. I do predict that some open carriers will be arrested at the event. They want to show how peaceful they are and how they aren't afraid of the police. They want to show average people that they also shouldn't be afraid of men whose training, experience and judgement with deadly weapons is unknown. In my experience the people who open carry work closely with local law enforcement in advance of events. They tell the police who they are, where they will be, and what they will be doing at what time. They know the state and local laws cold (which they will happily gunsplain to you). The also know which public locations are safe as well as which private businesses welcome them. Win or lose, the image of an open carrier being peacefully arrested by big government will be used to fuel their righteous anger. Photos will show the open carriers are the real victims and their rights are under siege at all times, everywhere, by everyone. Do we use trumped-up charges or just old ones? The government will use trumped-up or old charges for white Oath Keepers too. But the government won't try as hard to arrest them in advance as they will to arrest peaceful democratic protesters. I think that is a mistake and a waste of resources, but arresting dirty hippies is always on the to do list. But why won't they arrest more in advance? One reason is that the gun carriers love to tell people they are a "hard target" and how they will shoot law enforcement if they try to arrest them. Cold dead hands quotes abound. I also think because a large number law enforcement are RW white guys with guns. they identify with them and expect them to follow the rules and comply in a tense situation. Of course if they don't, it they screw up and have an gun accident, they are given a pass because they "didn't intend to do anything wrong." Many police also really dislike open carriers because they know they are adding stress to an already tense situation. The idea that is pushed by the open carriers is that protestors with guns will help the police in a shoot out with outsiders. (That was disproved recently) Do people believe white open carriers are automatically on the side of police? Do they feel the same about open carriers of other colors? One thing we do know is that some white people who protest while carrying guns aren't on the side of government law enforcement--at all. Remember this guy, Eric Parker? 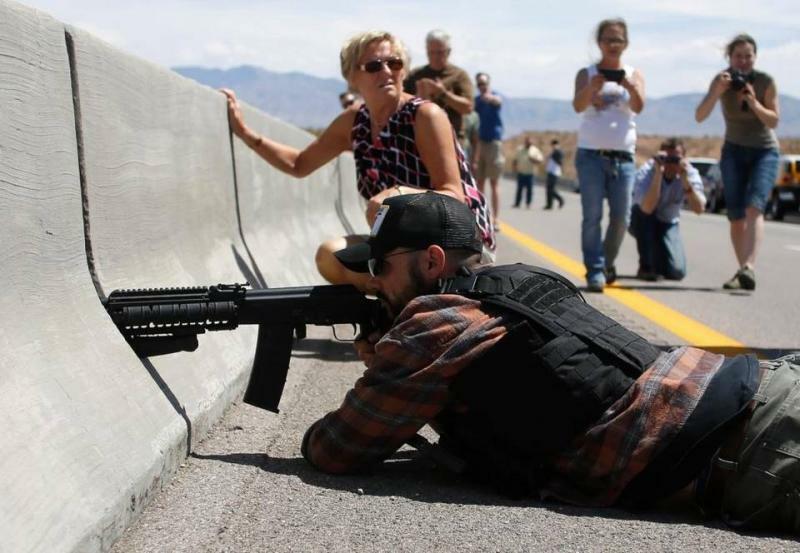 Here he is in April of 2014 aiming his rifle at federal agents near the Bundy Ranch in Nevada. He also went up to Burns Oregon to protest, but wasn't on site at the Malheur National Wildlife Refuge in December 2015. Feds: "We'll give you two years to stop pointing your guns at us!" 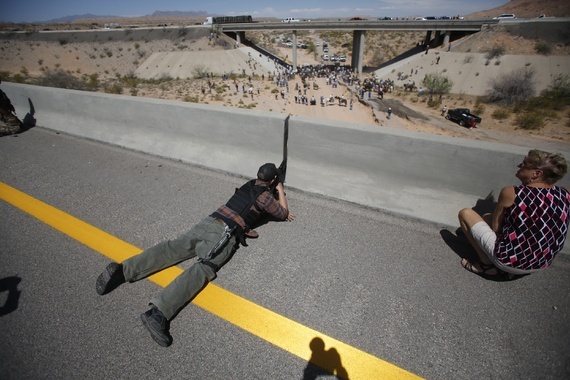 The government treated Parker and his buddies, white men pointing guns at the feds, with fear and respect. However, instead of arresting and prosecuting those people right away, I know deals were cut in exchange for no further protesting, or for turning state's evidence on others in the group. You will note that people who stopped going armed to protests made statements in the media saying that what happened in Malheur was wrong. However, in a big group, not everyone gets the memo to stop poking the tiger. I think these are the people who will be showing up at RNC to protest while openly carrying. They want to give the impression to the public that they are good people to be trusted . They might be, but whatever happened to that group of white men who protested with guns? It turns out that the government shouldn't have trusted them. Some didn't honor their agreements, others ignored the conditions they got in exchange for not being arrested. Imagine that, an anti-government group going back on their word with the government! So now the government gets to arrest them with stronger evidence. Yay for justice, but it took two years too long. I'm actually an optimist, not an alarmist. All this open carrying might go smoothly for both black and white open carriers. Everyone might remain calm and there might not be any "bad apples" who didn't get the memo to be chill. If all goes swimmingly the difference between the two groups will be how law enforcement treats them and tracks them after the event. Based on this history of white men with guns protesting, after the event law enforcement might contact them. "Hey, we know who you are. What you did was stupid and dangerous, just don't do it again." This is another example of whites' gun privilege. After the event law enforcement will contact the black men. "You are a troublemaker and a pot stirrer. We have our eyes on you. One slip up and bam, you are a felon with no gun rights. Stop doing this. Don't be stupid, you are just putting yourself in danger." A safe open carry event will be positioned by the media (especially the RW media) differently depending on the color of the group that successfully does it. For the white guys, photos of their restrain while armed will be praised. "See? Nothing happened. Nobody got shot. Everyone got scared for nothing. They are the good guys." For the black guys photos of their restrain while armed will be used to show they are violent extremists waiting to riot. I point to the time one unarmed New Black Panther at a polling place door in 2008 made Sean Hannity lose his mind. "He is intimidating voters! People feared for their lives!" In the video is a New Black Panther at a Philadelphia polling place in 2012 opening the door for women. Now I could describe what would happen if there is an incident, but I have to spend some time fixing my engines before I can slingshot around the Sun for a look at the future. Maybe next week. But here's a question about the future. What if we don't "dodge a bullet" and something bad happens with all these open carriers? Would it get people in Ohio to say, "Hey, we should CHANGE THIS LAW! Why are we putting ourselves in this stupid position?" And if they do, what can be done to get their wish fulfilled before the NRA kills any change? Why don't we prepare for that future?